Goal Updates! As if you care! The original goals post is here. 1) Descend harder on a MTB -- Hit a log and hurt my hand at Mt Snow, pushed hard enough on last lap to make my triceps cramp. This is going well. Vermont 50 is coming this weekend, so more chances to tear down hills I've never preridden, so I'll make up a lot of time until I go over the bars. 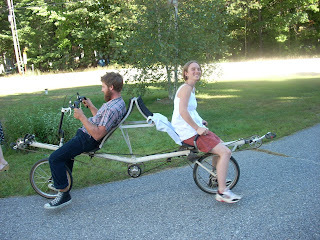 2) Learn to Cross Mount Correctly -- Going badly. 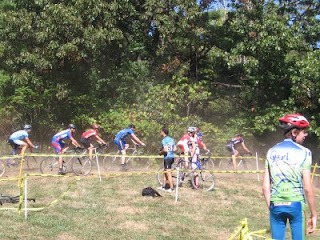 I went over the barriers on the last lap at Bedford with Mike Z and he killed it, while I did the lame stutter step. These were slightly downhill barriers, and I still only lost half a bike length. So this just doesn't seem pressing. One of the great things about cross is that you can do it twice in a weekend because it's not as physically destructive as mountain biking. So instead of spending Saturday farting around and resting up for Sunday's MTB race, you can just race Saturday, and if that doesn't go well there's always Sunday. Which isn't to say that Sunday won't be a bit slower, but it's not a guaranteed suckfest like back-to-back 3 hour MTB races would be. So with that in mind I headed up to Bedford Sunday for some more cross. 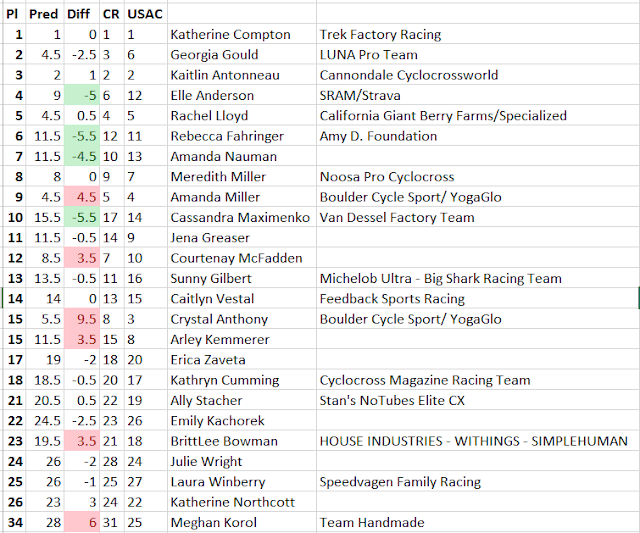 The good news was that I was racing the 3/4 race, so no pros crushing me and no sixty minutes of hell. The bad news was, I could definitely feel Saturday in the legs, and the Bedford course was far more roadie-friendly than Eco Cross. Instead of singletrack and turns, Bedford featured long, rough, grassy straights that demanded the kind of seated watts I just can't produce for very long. Here's some pictures from Alex. There would be more but I already feel vain enough posting three pictures of myself. Three ways to get up the sand -- Pierre pushes, Ben rides (mostly hidden), I carry. Looking halfway decent setting the bike down. help help it's Matt White and he's coming to rip my legs off! Ok, so when we last left our intrepid hero he was freaking out about the unspeakable beatdown he was going to receive riding Open Men at the Eco Cross. Let's see how it went! Well, the initial prognosis was not lookin' good. As if Toby and friends on the prereg list weren't enough, a certain legendary cyclocrosser whose name rhymes with "Shark McCormack" was there. Various Keoughs were rolling around wearing some national champ stripes, which was intimidating me. My old buddy and pro roadie Ward was there. It was looking grim. I said to Josh, as we waiting in the shade for the women to finish up, "Well at least Matt White isn't here." 5 minutes later, guess what jam-related team rider rolls up? EFF US. Crosshype: How Fast Is Tim Johnson? 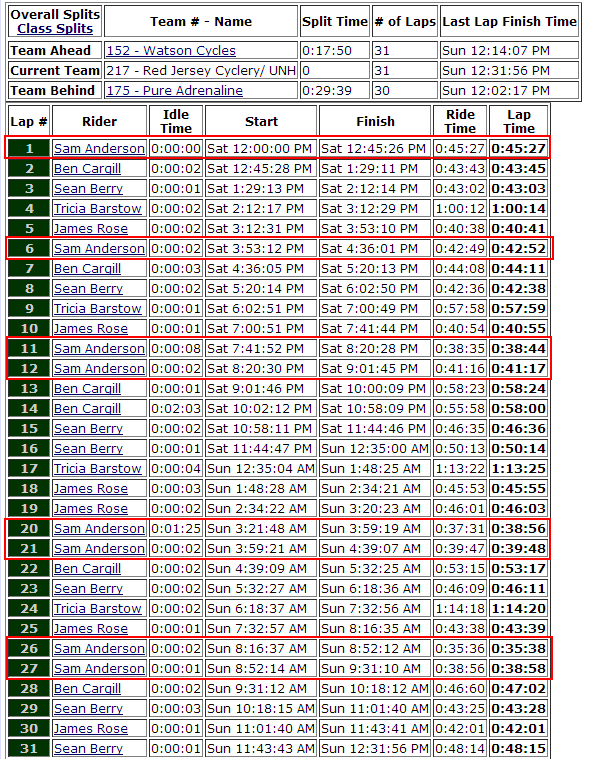 Everyone knows that Tim Johnson and the rest of the Elite Men field is ridiculously fast. But how much faster than you is he? What about Elite Juniors? Or A Masters? Or B Men? Anyone could look at lap times and answer these questions, but it's a fair amount of number-pushing to get to the points where you can say "Tim Johnson rides X% faster than me." Lucky for you, I like numbers, so I did the heavy lifting, and now I want to talk about it. If you're anti-math or anti-cross, read on at your own peril. 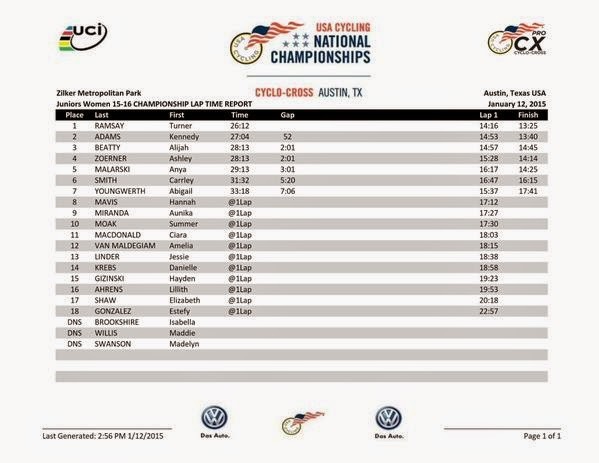 Ok, so we're going to use the results from Caster's Grand Prix last December. Not because I have a particular affinity for that race, but it had long laps so it's pretty easy to figure out how many laps each field did. And the results have times for almost everyone, which is great. While the rest of the blog-reading world was at Sucker Brook getting their cross season started, I was up at Mt Snow getting my MTB season ended by an event that's so tough, they spell classic with a K. Hard. core. Later on we skipped a woods section up by the snowmaking pond with another face-to-stem fireroad climb that was almost as steep, looser, and came at the end of nearly 20 minutes of climbing. So that didn't exactly make things easier. Ok. It's been seven weeks off. Let's do this thing. 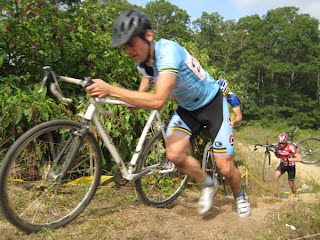 Sunday I went with my buddy Bryan down to Wompatuck to do the Landmine Classic. This was a cool event because it was a 1-lap 22 mile course, and since I'm a dirty cheater I prerode about 80% of it last weekend. So I had the position of every single rock in every single rock garden memorized... well ok, I knew that there were tons of rocks and very little climbing. It was Bryan's first race in like 3 years so he rode sport. He almost tried to ride Beginner but I shamed him out of it. Score one for not sandbagging. Ok, so this blog has been pretty quiet for a while. It's because I've been adhering two my own two "rules of blogging" -- 1, Don't blog when you have nothing to say and 2, Don't blog when you don't have time to do a decent job. So I haven't finished a race in 7 seven weeks (see rule #1) and I spent this past weekend moving into a new apartment (#2). So I've had more pressing concerns, like getting some freakin blinds up in my room since you can see straight into it from the street.